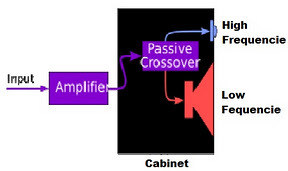 Crossover is a tool that serves to limit the "frequency range" to be received by the speaker. Crossover is used to regulate flow to the tweeter, the midrange, midwoofer, and bass to the subwoofer. There are two kinds of crossover, the crossover passive and active crossover. 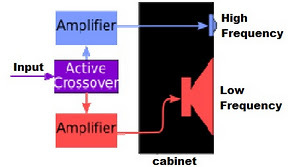 Passive crossovers work after receiving the output of the amplifier, are ineffective because they are throwing power amplifier, because the passive crossover frequencies have been processed in the "boost" (increase) by the amplifier. Active crossovers work so signal generated by the head unit (pure signal), dividing it in accordance with the desired frequency boost later in the amplifier, so that the amplifier to work more efficiently, and frequencies produced more organized in accordance with their respective purposes, tweeter, midrange, woofer , subwoofer. A little short in the use of an active crossover is the use of 12V power, ground, and remote. In theory this could lead to "noise" on the audio system, but do not worry, by the proper installation, and use good quality products will not occur a problem, as in any "competition-level car audio system". If you want to raise just a little audio sound quality, passive crossover is the right choice. But if want the sound quality is really good you should select an active crossover. Active crossovers require special mounting, especially for power cables and ground wires, but the effort is proportional to the quality of music produced. Active Crossover works by "cutting" is not frequency necessary before the "boost" by the amplifier, so the amplifier can focus on the frequency you want to hear, so do not waste energy Power.